Cooking dried legumes can be intimidating. For some reason, everybody seems to be thrown off by the whole idea of soaking and cooking legumes in the near future as opposed to making a dish instantaneously. But let me tell you – it doesn’t require more than a pot of water, some heat, and time. My hope is that by the end of this article, you’ll see that dried legumes are really not that difficult to prepare. I personally default to dried legumes 99% of the time. I make a large batch and freeze the extras until I need them for a recipe. Fortunately everyone in my family loves beans so they’re a part of almost every main meal I make. However, legumes (and the way people prepare them) can be kind of polarizing. There are soakers and there are non-soakers. There are soakers who toss the soaking water because of all the anti-nutrients, and there are soakers who keep it for all the nutrients and flavor. There are people who swear by the speed of their pressure cooker, and there are those who prefer a gentle bubbling of a slow cooker or the convenience of an oven. And then there are those who believe that canned beans are just fine. 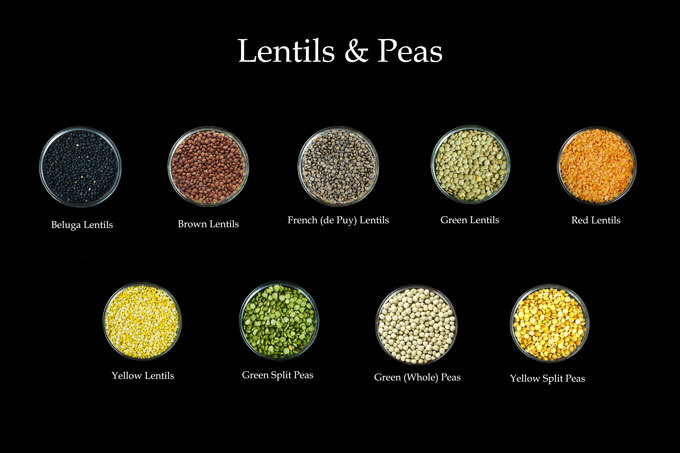 The legume family includes dried beans, peas, and lentils. In the diet, the term “legumes” usually refers to pulses, which are the edible seeds of leguminous plants. 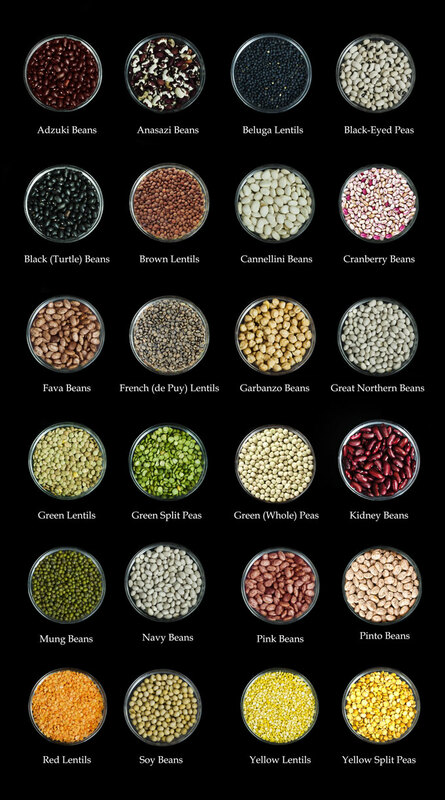 Depending on the specie, legumes vary in shape, texture, color, and taste. I could spend all day talking about why I love dried beans, but one of the main reasons is nutrition – dried beans contain up to 100 times less sodium than canned beans, and are higher in vitamins and minerals. Dried beans are also cheaper, taste better, and come in a ton of varieties. Oh, and you also get the bonus of a potful of delicious bean broth, which you can use to add flavor to soups and stews. So if you have the time, it’s really worth the effort to make your own beans at home. Lentils – I love lentils for their short cooking time. I use them in stews, dals, and soups because they are nicely soft after cooking. Beans – I use beans in so many different ways. Garbanzo beans (chickpeas) make not only delicious hummus, but they are also great as a crunchy snack or a salad topping after being roasted in the oven. My black beans and kidney beans are used primarily for chili or simply served over steamed rice with sour salsa and avocado. Split peas – I adore split pea soup. The peas thicken themselves as they cook and break down a bit, creating a lovely silky consistency. Freshness is really important when it comes to dried legumes. According to the Dry Bean Council, “beans that have been stored for over 12 months or in unfavorable conditions may never soften”. (1) Old beans will also have declining nutrient levels. (2) The best age for “fresh” dried beans is from harvest to four months old. Unfortunately, there’s no easy way to assess the age of dried legumes. Look for whole, firm, bright legumes with a slight sheen. Older legumes will look dull, appear darker in color, and have more cracked skins. Overnight soaking – put the legumes in a pot, cover them with water by two inches and let them soak for eight hours or overnight. Quick soaking – put the legumes in a pot on the stove, cover with water, and boil them for two minutes. Turn off the heat and let the legumes soak for at least an hour. Flatulence – legumes are rich in fiber and complex sugars, which humans can’t digest. Bacteria in the intestines digest these complex sugars while releasing carbon dioxide. The good news is that soaking reduces flatulence-related substances. (4) So if you have intestinal issues from legumes, soaking will definitely help. Anti-Nutrients – all legumes contain anti-nutrients (phytates and tannins), which reduce nutrient availability. Soaking – preferably in 113° F water – deactivates these anti-nutrients and significantly improves the amount of magnesium, zinc, and iron you absorb. (6) So keep in mind that while you might ingest more nutrients from unsoaked legumes, you might not necessarily absorb them. Flavor, Texture. Color – hands down, unsoaked beans are the most flavorful (with a rich, bean-y taste), cook more evenly (don’t fall apart during cooking), and come out deep-colored (as opposed to soaked legumes that come out rather pale). Clearly, for the best tasting and looking beans, do not soak. Another “big” question is whether to discard the soaking water or not. Obviously, this won’t matter if you decide not to soak your legumes. However, if you do, you’ll be faced with conflicting opinions once again. Personally, I prefer draining the soaking liquid and cooking legumes in fresh water. The question to ask yourself is why you’re soaking legumes in the first place. Since soaking water contains elements that you were trying to eliminate, it only makes sense that you also drain the soaking water. Essentially, all the points for soaking apply to discarding soaking water as well. Yes, you’ll lose some desirable nutrients. Yes, you’ll lose some dark pigment. But you’ll also decrease flatulence and the potency of anti-nutrients found in legumes. To get the most flavor, consider cooking legumes in stock or broth instead of water. Yet another controversial issue – does adding salt to legumes affect cooking time? Some chefs advise not adding salt until the very end of cooking because salt keeps legumes from softening. Other chefs advise to add salt in the beginning of cooking for the best flavor. To add to the confusion, some suggest salting the soaking water, but not adding salt to the cooking water until close to the end of cooking. You have soaked your legumes (or not), you have drained the soaking water and rinsed the legumes (or not), you have covered them with fresh water and salted them (or not) and now they are ready for some heat. Stove-top – put legumes in a pot and cover them with at least 2 inches of water. Bring to a boil and remove any foam that forms. Reduce heat to a bare simmer and cook until tender (the cooking time will vary depending on the legume). Never let your legumes reach a strong boil; this could lead to unevenly cooked legumes with burst skins. Slow cooker – put legumes in a slow cooker and cover them with at least 2 inches of water. Add any herbs and spices you like into the pot. Set the slow cooker to the low setting and cook until the legumes are tender (the cooking time will vary depending on the legume). Note: if you’re cooking kidney beans, you need to boil them on the stove for 15 minutes first before adding them to the slow cooker. Kidney beans contain toxins on the outer skin when raw or undercooked. Pressure cooker – put legumes in a pressure cooker and cover them with at least 2 inches of water. Add any herbs and spices you like and a tablespoon of neutral oil to help keep the foam from clogging the vent. Cook at high pressure anywhere from 5 to 10 minutes for small legumes to up to 35 to 40 minutes for larger beans. Oven – put legumes in an oven-safe pot and cover them with at least 2 inches of water. Bring the pot to a boil on the stove. Place the pot in a 325°F oven, cover, and bake until tender. what i wanted to know was the appropriate cooking method for dried beans and legumes whuch was not staed in this article. Hi Angelie – I am sorry you didn’t find the information you were looking for. Do you have any specific question? I am not sure what information I left out … just to recap some of the things I mentioned in the article, soak dried legumes in cold water overnight (you can also do a quick soak in hot water for about an hour). Drain the soaking liquid and give the legumes a good rinse under cold running water (if you’d like more flavor, you can actually cook the legumes in the soaking water – just make sure you rinse the legumes before you soak them if you’re planning on using the soaking liquid). If you’re using a stovetop, add the legumes into a pot and cover them with at least 2 inches of fresh water. Bring it to a boil, remove any foam that forms, and add a little bit of salt. Reduce the heat to a simmer and let the legumes cook until fully tender. That’s it. Let me know if you have any questions. I want to know whether cooking of legumes increase protein,fat, minerals or vitamins content? Hi Amjad – cooking actually decreases the nutritional value of beans. 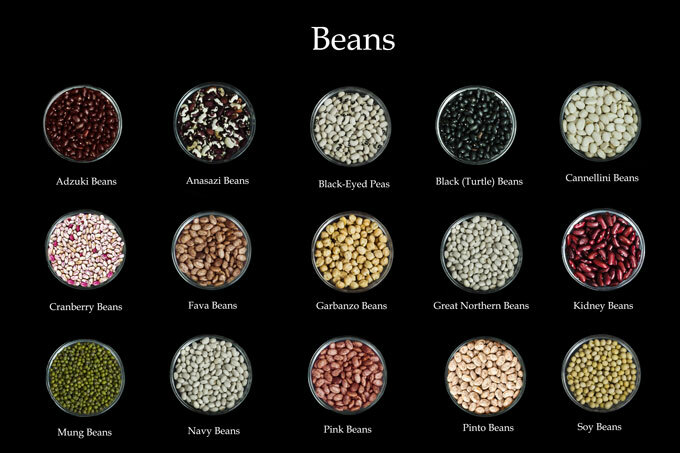 About 70% of bean nutrients are retained during cooking, including 86% of the protein, 83% of the iron, 96% of the zinc, 66% of the niacin, and 70% of the thiamine. About 53% of the calcium content, however, is lost. These numbers take into account that nutrient concentration diminishes during cooking because the beans take on moisture. For instance, one cup of dry kidney beans containing 44 grams of protein expands during soaking and cooking to two and one-half cups containing 38 grams of protein. Cooking does increase the bioavailability of some minerals and phytochemicals as well as protein digestibility. What does significantly increase the nutritional value of beans is sprouting. Sprouting increases vitamin content, especially vitamin A, B’s, C and E, along with boosting calcium, iron, selenium, and zinc. The quality of protein and carbohydrates improves, as the sprouting process begins to break down the complex proteins and starches into amino acids, peptides, and simple carbohydrates needed by the seed to grow. At the same time, anti-nutrients such as phytic acid, protease and amylase inhibitors are neutralized. This makes a sprout very easy to digest with highly absorbable nutrients. My compliments to you on a well presented and thorough presentation. Still left with deciding on the either ors ( drain or not, salt or not…. ), but beans are a win whichever method is chosen! Aw, thank you so much for such kind words! ❤️ I have two children – a 4-year old girl and a 10-month old boy 🙂 I always try to come up with new recipes particularly because of my daughter (she is such a picky eater!!! 🙂 Wow -you’re from Vienna. I was born in the Czech Republic and spent a lot of time in Vienna. It’s a beautiful city! Thank you once again for stopping by.